If you need to buy a gift for a guitarist and have no clue what they would like, this guide will give you gift ideas that guitarists will actually like and find useful. I will also explain how to figure out if a gift idea will suit the guitar player you’re buying for or not. I’ll also explain why each gift is a good idea so you can explain it to the guitarist you’re buying for. Every year I receive gimmicky guitar themed gifts such as guitar-shaped ice cube trays, guitar coffee mugs, a guitar egg slicer, and even a guitar spatula. 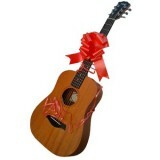 Please avoid the temptation to buy a tacky guitar themed gift! While there will be a small minority of guitarists who like these type of gifts, most guitarists get tired of getting these gifts and most will end up in the bin. There are very good reasons why you shouldn’t get any of the above gifts. Some of the items such as a capo or tuner, a guitar player only need one of. Buying them another capo is redundant and useless. Even if the tuner or capo you buy is better than what they use already, they’re not really getting anything new. It’s the equivalent to buying the person a new pair of socks – while the socks may be better, it’s not really anything new. Every guitarist (apart from brand new beginners) owns a capo and tuner so don’t buy them another one. If they play electric guitar and don’t have a tuner pedal, then it’s a good gift idea (I recommend the PolyTune 2 Mini). Otherwise, getting a new tuner isn’t going to make much of a difference. Other items such as sets of strings should be avoided because there are many different options with strings and the chances are you will buy the wrong type. Buying the wrong gauge strings or accidentally buying acoustic guitar strings for an electric guitarist are common mistakes and render the gift useless. If on the other hand ,you know exactly the strings the guitarist you’re buying for uses, it’s a great gift because it will eventually be needed. The reason I normally advise against buying guitar pedals as a gift for a guitar player is because pedals are a very personal thing to a guitarist. Every guitarist has different tastes and preferences when it comes to guitar pedals. Some guitarists will only consider certain brands while other guitarists will only look at vintage analog pedals. 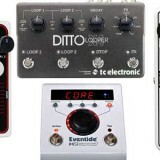 Accidentally buying the wrong brand or buying a digital pedal for a vintage enthusiast is a common scenario for gift buyers. I’ve seen a person spend over $500 on a pedal for a gift only to see the guitarist dismiss it as rubbish (it’s fair for me to say that some guitarists can be snobs when it comes to guitar gear). 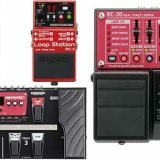 To make things worse, some types of pedals are safe choices for most guitarists, while other types of pedals are not safe choices. 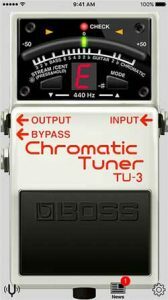 For example, you could buy pretty much any delay pedal, drum machine or a looper and most guitarists would find it useful. On the other hand if you bought a distortion or overdrive pedal, there’s a very high chance the guitarist won’t like it because distortion and overdrive are very personal effects. Every guitarist has specific ideas on what type of distortion or overdrive pedal they want to use so it’s very easy to buy one that doesn’t suit the guitarist. 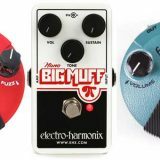 So my advice here is to only buy a guitar pedal if you know a specific model that the guitarist is looking for or if you know the guitarist is open to any types of pedals. If the person you’re buying for is very particular about their pedals and they only have 3-5 in their rig, it’s likely that they’re picky with their pedals. On the other hand if the guitarist has heaps of pedals or don’t seem to care about brands, then that’s a sign they will be open to your gift. Buying a guitar is the ultimate gift for any guitarist. But that doesn’t make it any easier. Guitars are extremely personal and it’s really easy to buy the wrong guitar for a person. If you really want to buy a guitar for somebody, give them a gift certificate or take them to the shop to pick out the guitar. It may not feel as fun to you compared to wrapping up and handing over a guitar, but the results will always be far better. Taking the guitarist to the shop to pick out a guitar is a great experience because you get to both share the excitement. I’ve recommended this over the years to parents and spouses and the results were always great. It turns the gift into an experience because the guitarist gets the excitement of trying out different guitars in the shop and finding the one that suits them the best. I know it sounds really tempting to buy it in secret and give them a surprise, but unless you know what type of guitar the person really wants, it’s a very risky choice. Share the experience by taking the guitarist to the shop to pick out their guitar. As a guitar teacher I am in the fortunate position of noticing typical habits of a lot of guitar players so in this guide I will share the type of guitar products that make excellent gifts. The best guitar gifts is something unexpected but useful. You need to also make sure they do not already own the gift in one way or another. For example if you were to buy a guitar slide, it’s only a useful gift if the slide you buy is different to the slide they already have (eg: a glass slide instead of a metal one). Otherwise it just doubles up. The gear I have suggested in the below guides have been chosen because it’s very rare I see guitarists already own the suggestions. I’ll be adding more ideas to the above guides over time so you can always bookmark/favorite this page and use it for future occasions. I’ll be adding to this guide over time so if you’re stuck and need some advice on picking the right gift, please let me know here. I’ll answer your question and update this guide if relevant.